Jacob Eason says the decision to transfer to UW was "pretty easy" because "I grew up a Washington Huskies fan and (was) able to come down to games. I wanted to go somewhere where I could play in front of my family and friends." During Jacob Eason’s official recruiting visit to the University of Washington in December 2015, offensive linemen Henry Roberts and Trey Adams were handpicked to serve as the five-star quarterback’s host that weekend. One memorable dinner they had together that weekend was atop the Space Needle. Roberts felt a quick connection to the quarterback from Lake Stevens. “We got all dressed up and went out and had a good time,” Roberts remembered. The Huskies were disappointed to learn shortly after that weekend visit that Eason had reaffirmed his commitment to play for Georgia. Eason went on to win Georgia’s starting QB job as a true freshman. Fast-forward to the fall of 2017, after Eason went down with a minor knee injuring, opening the door for another freshman QB to take over at Georgia, and leaving Eason an opportunity to transfer home to Washington this winter. That’s another year away. For now, Eason is settling to his new environments at UW, learning a new playbook and building new relationships as he patiently awaits his turn to take the reins of the Huskies offense in 2019. This spring, Eason has been, in effect, the No. 5 QB on the Huskies’ depth chart as he prepares to sit out the 2018 season under the NCAA’s transfer requirements. He will be a scout-team QB this fall. “This year is definitely going to be a great year for learning and getting better in this program and making relationships with some of the guys and coaches on this team,” Eason said after practice Monday morning, his first interview with the Seattle media at large since his transfer. Granted his release from Georgia in January, Eason said he briefly considered other schools as transfer destinations — Notre Dame was reportedly one of them — but wanted to come home all along. He enrolled in UW spring-term classes on March 26 and had his first Husky spring practice two days later. He says he has “a lot” to learn from Browning, entering his fourth season as the Huskies’ starting QB. 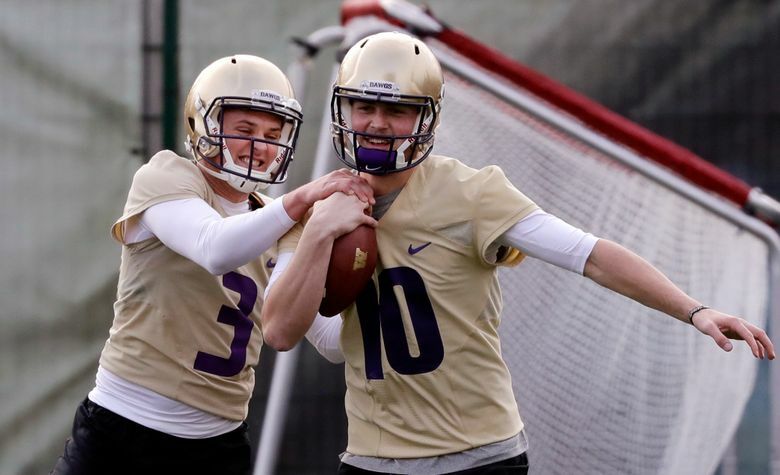 With two other touted quarterbacks — freshman Jacob Sirmon and Colson Yankoff — added to the mix, the Huskies’ QB room had much different look this spring. Eason says he’s trying to help the freshmen while they all learn the new playbook together. “It’s different. It’s another one of those roles that I had to get used to doing, but it’s cool,” Eason said. “Being a transfer, you have experiences from your other school playing as a freshman. Now you come here and you’ve got freshmen coming in, but also there’s an older guy (Browning) playing.